Support for latex? Like MathJax or Katex. Any plan for this? Very welcome news. Thanks and good work! Great! Going to test it right now! Nice job folks. Thanks so much for being responsive to this. We just released math editing ! Let us know if you have any feedback. Wow! I see it in progress! When will it be released? Came here specifically to request this. I'm a mathematics professor and can definitely see possibilities for GitBook in my courses -- having mathematics notation support is really essential. MathJax is super simple and would be preferred. I joined gitbooks because I saw that you were able to use MathJax and got excited only to see that it no longer is supported. I was planning on creating math notes using LaTeX for my sister and having them on gitbook. No math is a no go. Agree. Machine Learning and Deep Learning would be more and more popular, and it needs many math formulas in those kind of books. Just found gitbook and it looks perfect for my needs, except for the lack of math and citation support. Bringing back KaTeX plugin and bibtex-cite plugin will make this a no-brainer purchase. I left GitBook for other reasons but I can’t come back without math rendering support (both inline and display). @Eric: Ah yes. Vote upped. @Luke Janicke: Haha.. Sorry~~ My mistake. @Luke Janicke: Similarly, can't migrate to new gitbook from old gitbook. Unfortunately, the only way to get mathjax to render without a refresh was by placing an ugly set of commands at the start of every page, and this should be avoided in the future. 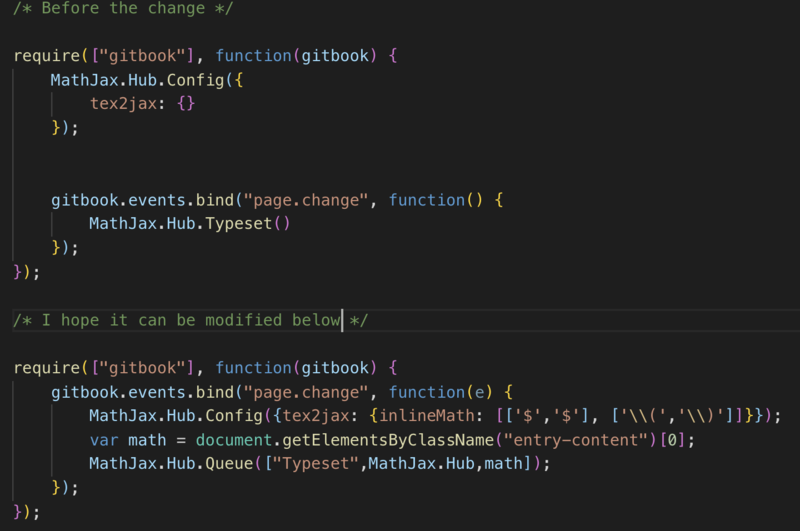 @James Schloss: How to load the mathjax plugin in the new gitbook? @saturn: The new gitbook is doing away with plugins, so far as I am aware, so there is no way to do this currently. That's why we are suggesting it here. Katex was one of the best plugin of gitbook. Please port katex for new gitbook version.